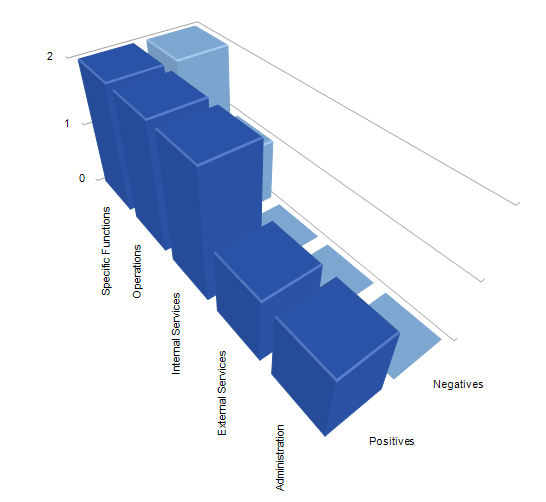 In addition figure 5.2 above displays the grades of employees and respective sections from the entire sample. A plausible explanation of the outlier (operations section participant) could be related to the employee grade level which may indicate competence or authority restrictions scale 18 employees may encounter when tackling obstacles outside the remit of their section. Interesting to note that this specific section is made up of 5 employees including the section Director which hypothetically can easily symbolise a typical Agile team. Furthermore, statements by the two participants from this section sustain such hypothesis. Their responses to the burden of obstacles outside their remit included statements such as: “there is a dedicated person in our section but works on flexible hours”, and “we have a dedicated person on reduced hours”. As to standard practices they stated that: “internal agreed practices that are working fine”, and “via a generic email address”. These practices resemble the Agile approaches of obstacles handling via the team facilitator role and self-managed teams, and therefore facilitating the process of this specific section to evolve into an empowered Agile work team (section 2.3.4). The data analysis revealed several matching patterns with those predicted in the conceptual framework. For instance, participants’ main discourse proofed that Agile methodologies yield better visibility, communications, and efficiency as summed up by the following statements: “Yes, because of the clear definitions of tasks and their priorities, monitoring of our progress and the ability to adjust according to the need, and frequent refresh of tasks”, “Yes, it gives me an opportunity to program my work better and more efficiently”, “Yes, because longer delays may cause complacency, hence, better to meet frequently even if there are no major issues or changes”, “Yes, because it helps avoiding duplication and unnecessary work”, and “Yes, because your opinion/feedback is valued and counted”. In view of operational management, participants argued that a self-managed team is more effective when taking the lead and has autonomy to perform its work, and assign tasks according to each member skills. The approach made them feel trusted, respected and gave them a sense of ownership as summed up by the following statements: “I feel more responsible, trusted and owner of tasks”, and “Yes because the team aspect helps share tasks according to skills in a better way”. In line with the predicted outcome, participants demonstrated confidence that such methods will inspire them to work better, feel better, and be more effective. Two complementary comments that show how much participants engaged with and understood the new approach were: “Yes because it helps reducing social loafing”, and “Yes, assuming team members are mature and knowledgeable in their respective fields, then they would be more effective”. Here, we see that Agile methods have triggered a thought process resulting in detecting weaknesses which most probably are present in the current context – the need of a skilled workforce and the need to divide tasks so that each member has his or her own individual deliverables that are easy to measure and evaluate. Another participant had this additional statement: “Yes, because tasks are clearly defined and dependencies of my tasks have a known member and do not remain unassigned”. The relationship between obstacles removal and productivity was very strong as all participants associated it with distractions affecting their performance. Eventually, “it allows me to produce more output” was a frequent comment. Actually, this is what Agile attempts to achieve, that is, allowing room for the unexpected and assigns a role (team facilitator) that handles such unexpected impediments, and in consequence helps the team reach its goals. The fact that participants had no concerns in linking the objectives (product/service) owner and team facilitator Agile roles to existing public service positions indicates that the public service has ample resources in place that can be trained to fill up the new roles. Mostly attributed the new roles to a Director and/or an Assistant Director and only few participants did not see any relationship to existing roles. In actual fact, any willing educated public servant can be trained to become a product/service owner or a team facilitator. The main concern raised with regards to a potential Agile implementation in the public service was the current work culture. This part of the analysis exposed the different attitudes of employees towards a culture that according to them is hindering the current public service context. Almost all agree that this is the main issue, however, there are those who see an opportunity to instigate a change using Agile (16 participants) while, one participant prefers the status quo and two participants believe it is not possible to change the present work culture. Three other interesting reasons given were ‘the lack of appropriate skills among staff’, ‘the sensitive/classified tasks within the Ministry where access is given only to particular individuals’, and ‘the excessive bureaucracy’. Participants that initially admitted that it is not possible to change the public service culture where provoked to think about the new methodology in terms of introducing a new way of doing things (working) without calling the process Agile or any other alien name to the public service context. The tone of these participants changed and later argued that there exists a possibility that such change in operations could lead to a culture change indirectly and in a subtle manner, “I think it has potential to start a change in culture, it could provide a means to an end” one participant exclaimed. The same change of perception was also noticed when participants were told that the role of the trained team facilitator would include detecting lack of skills within teams and requesting external skilled members to join temporarily until a permanent solution is found. The various teams’ facilitators across the organization and in this case the Ministry, would have regular meetings including discussions about acquiring the required skills for teams to achieve their goals. Participants further insight into Agile made them re-think and later express themselves using discourse such as follows: “I like the idea, and it is definitely an improved system over existing practices”, “Yes, I agree that such process may help find a solution”, and “it would help a lot to have regular/routine meetings with the facilitator and this should provide a solution”. These extended discussions took place in the last part of the investigation due to the number of concerns raised by participants such as: “I am not convinced because in the public sector there are some officers without the necessary skills and are appointed in the wrong roles”. Furthermore, Agile team facilitators would be in a position to request and manage the exchange of team members from one team to another based on skills and attributes that best fit each team. Participants’ main concern about self-managed teams which is also noted in the literature review (section 2.3.4) was about the risks of overbearing and dominant or reluctant and passive members. Again, when provoked to think in greater depth about the role of the team facilitator and the regular short meetings, where team members can list the issue as an impediment, participants returned different opinions such as: “I agree that it can help solve the problem of low performing team members”, “Yes, it will facilitate the process of tackling the problem of weak members”, and on the other hand, “I admit that although such regular checks and balances are important, as proposed here they appear to be too frequent”, and “I agree that it may help solve the problem of complacent members but in the public service context, the command & control method is a must when there is a conflict between team members”. In order for this to work, one participant added that the facilitator must have some authority on team members. Agile does not allow the team facilitator to have direct authority on team members and tasks execution however, if the team defines and lists an uncooperative team member as an impediment, then, the facilitator must take action and handle the impediment. In fact, such explanation was interpreted by one participant as: “I agree that in this case, then Agile methods will help mitigate the negative risks”. Another relevant point raised during the investigation was related to sensitive tasks where classified data is handled and hence, cannot be shared with the whole team. It was in the discussion itself that a feasible solution was found. That is, either splitting the team into two smaller teams, one works on sensitive issues and the other on normal tasks. Else, one member exits the team process when requested to work on sensitive issues without sharing any classified data. In the latter, the task would be listed as classified in the list of all tasks to be done during the work cycle and once it is done the same member can pick the next one from the list. Some participant recounted the excessive bureaucracy, specifically the long delays experienced during routine approval requests. These participant stated that such delays would break the Agile work cycles and processes. Relevant participants were challenged to visualize the scenario where the team defines these long approval processes in their planning activity when breaking objectives into smaller sub-tasks and including them in the list of all tasks so that the objectives owner has visibility of tasks and respective timings. This way, every single step including wait-time for approval is listed and visible to all stakeholders, yielding a better picture of the duration of the whole task. One participant was prompt to reply: “That would be great because we would have a better picture where tasks execution is delayed (bottlenecks) and if someone can see this, it can help in solving the unnecessary delay problems”. It emerged that such Agile practices have the potential to expose unwarranted bureaucratic delays. In fact, the literature states that lessening of bureaucracy can happen when setting in Agile operational elements (section 2.3.2). Further breakdown of the specific function outcome discussed in section 5.2, the following comments by the respective participants supports the previous findings in the sense that well organized small sections tend to be receptive to Agile implementations. “Yes, because it is very similar to what we do today”, “Yes, we have already a mechanism in place but this could enhance it”, “Yes, we normally spend similar time discussing issues before starting work and we find it very beneficial”, and “Yes, we already do this, it provides continuous feedback”. 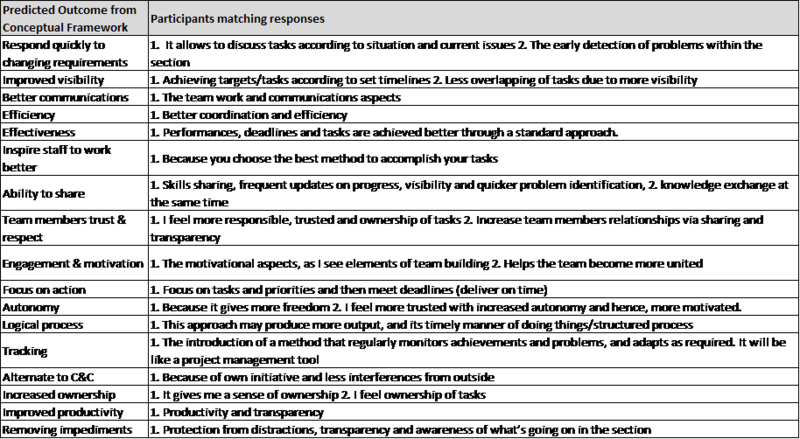 Finally, the predicted outcome from the conceptual framework is compared with selected participants’ comments to show the general trend of pattern matching and validity of the results as shown in table 5.1. The above discussion shows adequately that a pattern match exist between the research outcome and the predicted outcome derived from the literature. Summarizing the outcome, I can confirm that all participants engaged well with the Agile public service scenario and expressed themselves favourably to it. They highlighted important elements such as, interference with self-organization of work which reduces the outcome, employees’ identification with goals, and their involvement. On the other hand, ownership of tasks would yield enhanced productivity and employees’ satisfaction. In the final chapter I will present my closing remarks, making recommendations based on the positive outcomes discussed in chapters four and five, and suggest a way forward for future research in this area.